I have always been optimistic about the long-term future of dairy. I think it is likely that dairy will remain one of the pillars that underpins the New Zealand economy. But we sure do have some challenges! The first challenge is that urban New Zealand does not understand the extent to which our national wealth depends on the two pillars of dairy and tourism. Yes, there are other important industries such as kiwifruit and wine, and yes, forestry, lamb and beef are also very important. But rightly or wrongly, our population has been growing rapidly, and the export economy also has to keep growing. There is a need for some big pillars. Somehow, we have to create the exports to pay for all of the machinery, the computers, the electronics, the planes, the cars, the fuel and the pharmaceuticals on which we all depend. Our horticultural industries can help, and they will grow further. But most of New Zealand has severe limitations for horticulture. Soils, climate and a South Pacific location do not give us an international advantage when it comes to most horticulture. Coming back to dairy, this is where we do have an international competitive advantage. We also have three major technical challenges. The second challenge is greenhouse gases. This one is tricky. The starting point is to go back to the system dynamics of short versus long-lived gases. As long as we focus on the greatly flawed notion of CO2 equivalence, then we will not find the path. I have written of that before and at some time will do so again. The third challenge is finance. Our dairy industry has been built on debt. In the new world where the value of dairy land is tanking, where farmers are required to repay principal, and where many farmers simply want to get out, then the old cliché of a rock and a hard place comes to mind. First, let’s focus on the good news of how we can solve the urinary-N leaching. The starting point is to recognise that the science tells us that it is all about what happens in the second half of autumn and throughout winter. The cow piddle that occurs at other times of the year is not a problem. There is enough time before winter for the grass to soak up the excess nitrogen before it can leach. Winter grazing can also be OK in many situations as long as the cows do their grazing and are then off-paddock for the rest of the day and night. If cows are to be off-paddock for most of the day and night then they have to be on a soft surface. That means some form of soft bedding that stays reasonably dry. Most forms of off-paddock wintering are either animal unfriendly or too expensive. Concrete stand-off pads or other hard surfaces come into the first category. Free-stall barns typically come into the second category, although all of the free-stall farmers that I meet say they would not be without their barn. I do agree that free-stall barns can be an economic proposition for the good farmers who get things right. The new technologies that open up great new possibilities are composting barns. The composting barn technologies have been developed overseas – mainly in the USA but also in Europe. Fortuitously, there seems to be nowhere that they work better than in New Zealand, linked to our climate and farming systems. 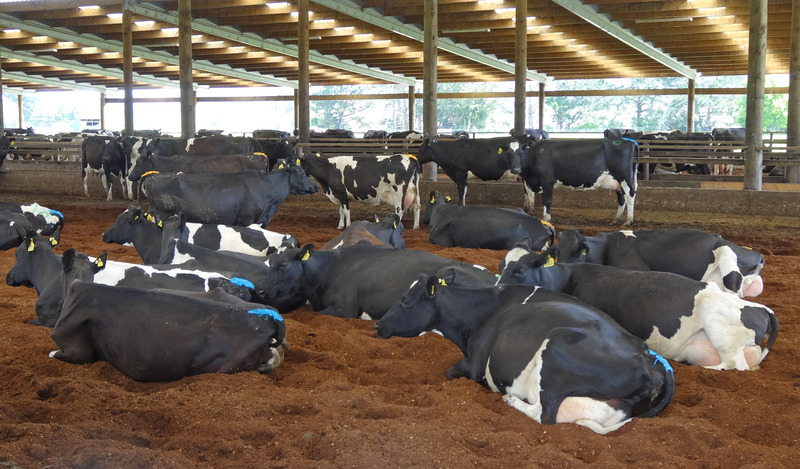 The essential feature of a composting barn is an open structure where the cows wander around at leisure, and lie in the deep bedding. The bedding provides a medium with which the effluent combines and turns to warm compost. All of the liquid evaporates. The cows love it. Of course, nothing is ever quite as simple as it might sound. There are key design features which combined with daily tilling are essential to make the system work. If farmers do things right, with both infrastructure and management, then it does work. Do things wrong and it does not work. I know of barns in both categories. For the last 18 months I have been observing and monitoring the Allcock composting Mootel in South Waikato. Tony, Fran and Lucas Allcock are now into their fifth year with the barn and it certainly does work for them. The Allcock Mootel is the best of the New Zealand barns that I have seen. If lots of people build composting barns there will be an issue with a supply of suitable bedding. The Allcocks have found sawdust the best of the options they have tried, but if we end up with thousands of composting barns across New Zealand there will not be enough sawdust. This last winter we trialled Miscanthus in the Allcock Mootel as an alternative bedding system. Miscanthus is a woody perennial grass that grows to about four metres in height and is harvested once per year. We learned a lot. The Miscanthus composted beautifully and the cows loved it. But the tilling system does needs to be different than for sawdust, which the Allcocks still prefer. It is clear that we still have more to learn about the Miscanthus system, but I am very optimistic about Miscanthus as a long-term solution. Another exciting project has been an Honours project at Lincoln University undertaken by Rachel Durie, with Guy Trafford and myself as the supervision team. Rachel’s research was to investigate how a composting barn might work at the Lincoln University Dairy Farm. A key result is that Overseer modelling indicates that urinary-N losses can be reduced from the current 42 kg per ha to 3 kg per ha under duration-controlled grazing. That leaves the main source of N leaching as being from cultivation for winter crops. And that is a reminder that cultivation for cropping of any type leads to nitrogen leaching from mineralisation. Rachel will be presenting her results at the Fertiliser and Lime Conference at Massey in February. I am looking forward to the discussion. To me, it is self-evident that composting barns provide the pathway to the future. However, although I am confident about all of the science, the farm systems and the economics, I am less confident about where, for highly indebted farmers, the finance to build the barns might come from. I think there are ways it could be financed but it won’t be straight forward. So that brings us back to a fundamental issue: we have too much debt right across the dairy industry. It is this debt that will make the necessary transformation of dairy systems so problematic. I’m not sure how your WP reply system works, however this is my second attempt at leaving a reply. Clearly you are a knowledgeable person who is across the current issues that are surrounding the use of our farm lands, however I just have to take issue with your opener: ” I have always been optimistic about the long-term future of dairy” . But do I detect some innate bias towards dairying. I’m a third generation kiwi of scottish & Irish decendants…and those early 6 days thou shalt work pioneers all would have thought their Christmasses had come at once…anything they planted in the soil, grew and grew like they had never seen before…by staggering the planting of grain , they had more than a good chance of a successful grain harvest…and our albeit intermittent hot hot late January and February months dried of the grain heads and the harvest was good and in many cases exceptional. Why your focus on dairying? Surely it must be said that now we are faced with cleaning up a long term pollution problem…something you don’t inherit from grain growing. And doesn’t it strike you funny that there is a similar happening in the US, where conglomerants have bought out/pushed out small farmers both in the grain & dairy sectors, to create mega dairy operations…which really only benefit the wealth of a small handful of individuals. But to move on quickly, just tell me what have “we” proved by skiting about the chemical killing of a hill side of wilding pines…that’s someone’s plan A, what’s their plan B, C & D. Are they going to invite an arsonist to fire it? There has to be a better way Keith. While pines are not indigenous to NZ, is not what they are showing us that natural biological selection is alive and well & important on the planet, and us mere humans who are not too good at considering the long long term outcomes for life on our piece of solar rock should not be making rash, hasty and actually nasty decisions because we think we know it all. I see no record of a previous comment from you in the system. With new commenters, the comments do go through an approval system. I always try and go where the evidence takes me, so if you think there is bias, then please identify the counter evidence. As it currently stands, we have science to combat the urinary-N leaching, but we do not have science to combat nitrogen leaching from those cropping systems for which cultivation is needed. Nitrogen leaching from cropping systems is a very big issue. Within NZ, grain crops are mainly grown for animal feed. Our crop farmers are unable to compete with Australians when it comes to producing good bread-making flour, and so we import it. As for the wilding pines which I wrote about in a previous post, I did not claim any simple answers. But I do acknowledge that those conifers, if left unchecked, would take over much of the high country and indeed have already taken over some of that country. And yes, every time that a weed species takes over on any land class we are seeing natural biological selection taking over. In the case of wilding pines, that was of course initiated by importation from overseas close to 200 years ago. My observation of current policy is that DOC has decided to fight the battle on the fringes of established wild conifer forests, largely to prevent further spread, plus taking aim at those areas where the wildings are present but have yet to create a smother. We tried the Miscanthus grass in our composting barn but found it to be no where near the standard of wood chips. We do milk out of the shed in the Autumn and Winter so our standards need to be high for a milking cow. I think I need to pay you another visit to learn from your experiences. The Miscanthus will definitely compost very nicely, generating lots of heat, and staying dry as long as it is not overloaded. But tilling with tyned implements can create some issues unless it is very fine-chopped. A number of farmers are also reporting good results from calf sheds, but once again there is more to learn. The Allcocks moved away from wood chip and much prefer sawdust or shavings to the woodchip.